A magnitude 3.9 earthquake rattled the Central Coast and woke up numerous North County residents early Wednesday morning. It struck at 3:58 a.m. with an epicenter 5.6 miles west of Templeton, 8.7 miles southwest of Paso Robles and 9.3 miles northwest of Atascadero, according to the United States Geological Survey. A swarm of smaller earthquakes followed the quake within the first few hours. 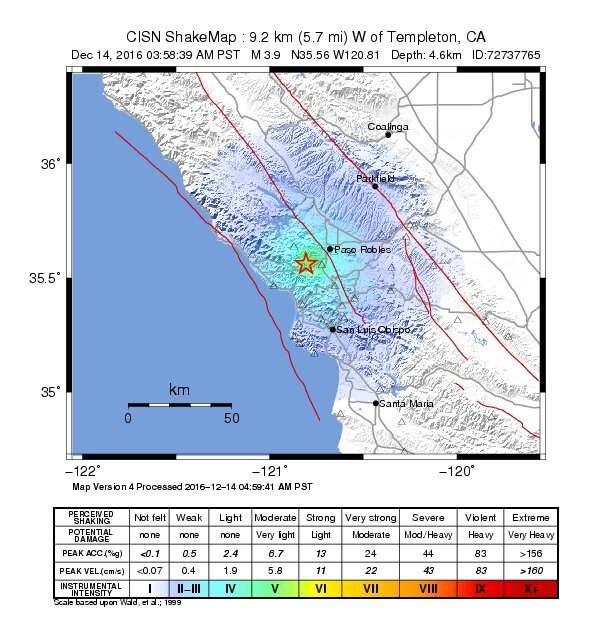 A USGS map shows shaking registered as far north as around King City and as far south as around the San Luis Obispo-Santa Barbara County line. Don’t be goin’ forgettin’ now. At 3:58 the full moon was at 1 o’clock. Just saying. I don’t know about full moon, but I have noticed (I think) that there seems to be more earthquakes during the two solstices of the year. Maybe tilting the Earth the other way (from the gravity of the Sun) has an effect on all of that spinning liquid mass that lies just under the solid crust. Or maybe I am just making it all up? Dunno . . . .
Actually, I am friends with a geologist who had grants to study earthquake prediction, who agrees with me about the timing of Solstices with quakes and also the effects of full moons on same. Tides are more extreme (higher and lower) during full moons and new moons and the weight of the water is enormous. Our coastline is the only one defined by a fault line and is therefore more susceptible to movement during times of such shifts. The San Simeon event happened on the day that fell between the Winter Solstice and the full moon. The liquid beneath our crust would be another factor to consider as well.